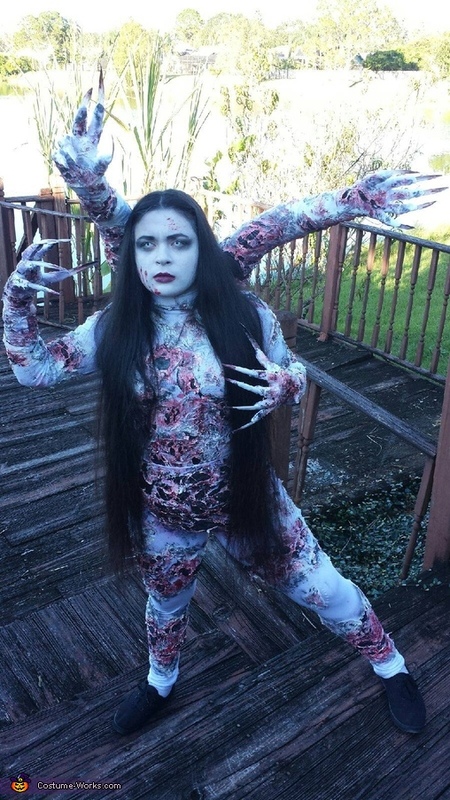 I am Cassidy-Rae, 21 wearing my homemade costume of a monster,Laura, from the video game:The Evil Within. Laura is a boss in the game and is tough to beat. It took four days (from morning to night) to make, I fabricated it with plastic bags, liquid latex, and then I hand painted it with acrylic using both small brushes and sponges. I had used a gluegun's metal tip to shrink every section of plastic bag to have a wrinkling effect. I purposely ripped off pieces of latex to give a burned effect. The extra arms are mold replicas of my own. Using duct tape to completely cast my arm. I stuffed the extra arms with wires and stuffing, even some pool noodle pieces. Total cost may have been around 50$-$70 That is also my own hair, not a wig. I glued long nails to each glove to give it a claw effect. The fake arms move when I wiggle my shoulders. A tip I'd have is to never make a costume last minute.